Thursday, June 3rd, 2004 | 9:21 pm	and filed in Music. I spent the last couple of days up in SF again. Tortoise was in town for two performances at Bimbo’s 365 Club. I went to both shows, but the second seemed better since the guys had a day to rest and relax. It was a little strange since I normally hang out with my friend Casey when they come to town. I miss not seeing him, but it was still nice to see everyone and meet the new crew. Johnny H. was saying that he was having problems with the fast food, so the first night a group of us went out for a nice dinner before the show. I was really exhausted at the end of the show. It was one of those days when I was running on caffiene and nicotine, and for some reason i decided to drive out to an afterparty in Oakland. Shea Ako is doing the visual magic for the tour, so we rode out together to catch up on things. We finally found the warehouse, and the party was pretty cool, but I was beat so I bailed before I passed out. I didn’t sleep enough and felt exhausted the next day. I met up with the guys the next day and did some of the touristy stuff. We went around SOMA, the Haight, Japantown… the usual stuff. While Shea, Doug, Johnny H., and Jeff wandered around the haight, I managed to sneak in a nice powernap in the car. The first night I ran around shooting photos, but the second night, I had the chance to relax and enjoy the show. As usual, I’m always impressed at their live gigs. They simply fantastic musicians. There was a slight change on this tour. 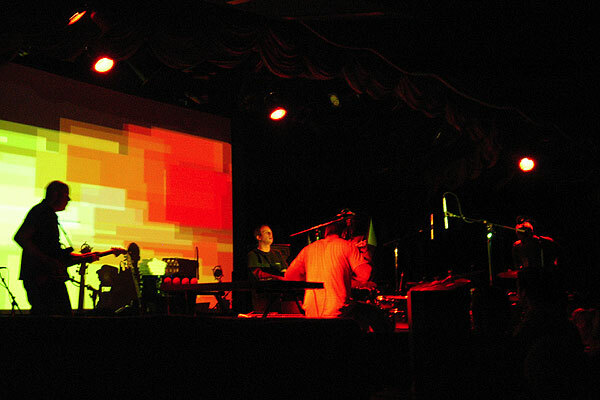 Armed with Laptops, Tortoise is using Reason during their live performances. They are playing LA tonight and tomorrow night. Then San Diego, somewhere in Arizona, and Texas, and the Midwest. Then they’re off to Europe! Definitely try to catch this tour!